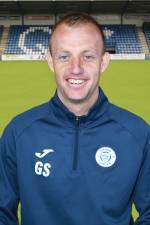 Gavin Skelton was the rather un-inspiring choice to replace James Fowler as Queen's manager. I say un-inspiring because, as Fowler's assistant, surely he was as liable for the perceived failure of the previous season as the sacked manager? What was inspiring was the re-signing of Queen's legened, Stephen Dobbie, which for a while had us all believing. However, the wheels came off a bit, and with rumours of all kinds of internal politics going on, Skelton's spell in charge didn't last long, as he was replaced by Gary Naysmith, who steadied the ship enough to keep us just above the relegation zone, without ever looking like getting back into the promotion chase. Hopes were not high at the start of the season, the choice of Gavin Skelton seemed to be the cheap option (see the intro), and I for one would have been happy to avoid relegation as the season kicked off. All that changed with the monumental news that Queen's legend, Stephen Dobbie, had re-signed for the club. The whole place was lifted, and it looked promising for a while, as Queens stormed to the top of the league, with Dobbie in particular supreme! Site wise, for the 7th year running, I cannot recall making any major changes.